Kieran is currently studying English and Liberal Arts at St Mary’s University College. Kieran joined Eire Og at a very early age and has had success at almost every level from Under 10 all the way up to senior level, including county appearances. Kieran won player of the year awards for both Under 10 and Under 12 football with the Ogs. 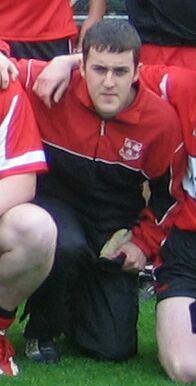 He also was picked for the county Under 12 squad in 1998. Then at Under 14 he won his first team honours as Eire Og did the double, winning both the football and hurling leagues. Another two Player of the Year awards came Kieran’s way in 2000 for Under 16 football and then again in 2002 for Minor football. He was captain of Eire Og’s Minor footballers and also made the county Minor football squad too. In 2001 he was a member of the team that won the Under 17 Sevens Football Championship. His first senior honours came in 2005 when he won the Martin Cup at Casement.